Karauli lies in the north eastern part of Rajasthan. stretching between 26° 02′ to 27° North latitude & 76° 28′ to 77°25′ East longitude, having an average altitude of 260 meters above sea level. 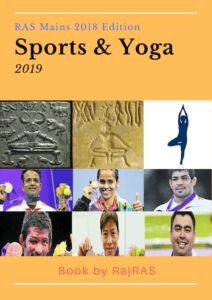 It is bounded on west by Dausa, South west by Sawai Madhopur, north east by Dholpur and north-east by Bharatpur and east by state of Madhya Pradesh. The main river of the state, Chambal separates the district from Madhya Pradesh. The district has an area of app. 4985 sq.km. and has been divided into 6 tehsils namely Karauli, Hindaun, Nandauti, Sapotara, Toda Bhim, Mandrail. The predecessor state of the princely state of Karauli, the Kingdom of Mathura, was founded about 995 by Raja Bijai Pal a Yaduvanshi Rajput ruler. Historical data point to Arjun Deo as the founder of the Karauli State in 1348.he capital was successively in the towns of Mathura, Dwarika, Bayana, Timan Garh, Andher Kotla, Mandrayal, U’ntgir and Bahadurpur. During the 18th century Karauli was under the Maratha Empire until the Marathas were defeated by the British. In 1817, Karauli’s ruler signed a treaty with the East India Company and became a British protectorate, the status was maintained till the independence of India in 1947. 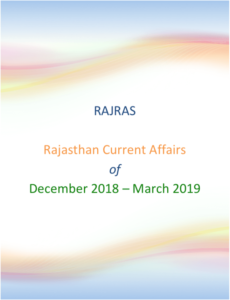 After India’s independence in 1947, the state under Maharaja Ganesh Pal Deo acceded to the Dominion of India on 7 April 1949; Karauli later merged with the Union of India and became part of the state of Rajasthan. On 1st March 1997 government of Rajasthan established Karauli district which included five Tehsils of Sawai Madhopur. The rulers of the state bore the title ‘Maharaja’. Karauli was ruled by Jadubansi Rajputs. Timangarh fort is situated in Masalpur village. According to prevaling believes in Samvat (Hindu Calendar) 1244 Yadhuvanshi ruler Timanpal constructed this Fort. On all four side of this fort their exists unique sample of 5 feet wide and 30 feet high battledore atchitecture.It seems as a complete city is enclosed within fort. Market inside fort wall, flooring, garden, temples and remains of well are still available. This fort was established during 15th Century in Kalyanpura village on a tunnel shaped high mountain range. The fort is spread over 4 Km of area, and has a 100 feet high waterfall which directly drop water over a Shivlinga. Till last Mughal Empire, this fort remained in ownership of Yadhuvanshi. The Fort is located on east of Unt Giri on bank of Chambal River. 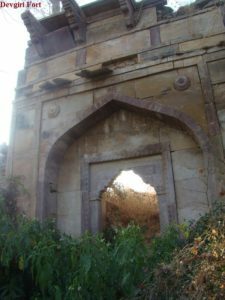 In year 1506-07 attack of Sikander Lodhi caused major damage to this fort. In present it has one Bavdi, ransacked stone scriptures and few remains of palace are available. 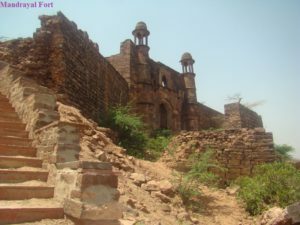 In south of Karauli, on the bank of Chambal River and between the mountain ranges, Mandrayal fort made of red stone is situated on a small hill. Due to its location near Gwalior, from the view of a monument it is considered important. The Surya Pol of Fort receives direct sunlight starting from sunrise to sunset. In year 1327 Maharaja Arjun Dev had acquired this fort, which remained under custodianship of Karauli. This fort is located on Mundrayal Route, near forest of Sasand Village and deserted environment. ‘Bahadurpura Ka Quilla’ stands like an insuppressible warrior is an actual example of inseparable Mughal art. Double storied Narp Gopal Bhawan, Saheliyon Ki Bavdi, Artistic Jharokha, 18 feet long girder of common and VIP courts, 5 warriors, Magadh Rai Ki Chatri are worth watching. 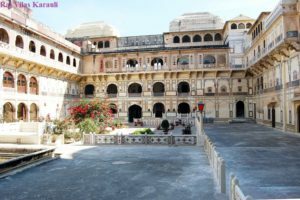 The fort was constructed by Nagraj was son of Yadhuvanshi King Timanpal, expansion of this fort was done throughout 1566 to 1644. Ruler of Jaipur Sawai Jaising also resided in this fort. 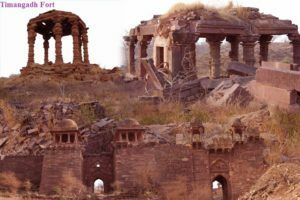 The Ramthera fort is Situated in Sapotara Subdivision of Karauli district between Ranthambore Wildlife Sanctuary and Bharatpur Bird Reserve; it is just 15 kilometers away from Kailadevi Sanctuary. Established during 13 century Palace (Rawal Palace) made out of Red and White Stone is an example of stone craft. Artistic pictures and carving on huge gate, reticulated vents, artillery, Nahar Kathara, Suri Gurj, Gopalsingh Akhada, Bhanwar Bank, Nazar Bagichi, Manik Mahal, Fountain Pond, Gopal Temple, Deewan-e-Aam, Fauj Kachari, Kirkiri Khana, Giyan Bangla, Sheesh Mahal, Moti Mahal, Harvillas, Ranglal, Teda Kuwa, Jannani Dayothi and others along with effective establishment are also part of its culture and traditions. 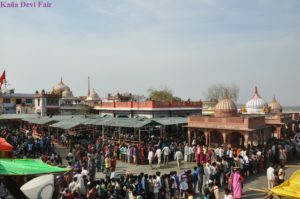 There are multiple fairs organized in Karauli including, Kaila Goddess- March- April, Shri Mahaveerji – April- May, Shri Bala ji , Shri Madan Mohan Ji, Ajnimata, Jagdeesh Ji, Gadh Mora, Barwasan Mata, Kadam Khundi, The Ganga Dushera Mela Sagar, Nande Bhumiya Fair, Mahashivratri Pashu Mela, Gandharbh Mela Kailadevi. The famous temple of Kela devi is situated 25 Kms. from district head quarters. Kaila devi fair is organized in month of march-april, in which men-women, youths, dance without the influence of religion, rich and poor on the Languriya songs. In this fair along with Rajasthan pilgrims from Delhi, Haryana, Madhya Pradesh and Uttar Pradesh participate. The famous Shri Mahaveer ji temple is situated in Hindaun tehsil. It is a prominent place of Digamber Jain Community of India. Here, resides a 400 year old statue of Lord Mahaveer. 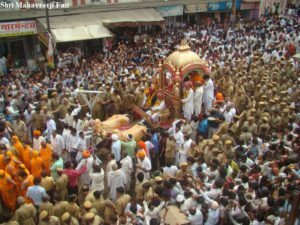 Three day fair of Jain shrine Shri Mahavirji fair has special identity and a chariot festival is the center of attraction. The fair is organized of Lord Jagdish in the Kaimri village of Nadouti region. The Gurjar community has a majority in the fair and the people of other category also come to visit the fair. Karauli is famous for its geographical specialities and having full of natural beauty and covered by Vindhyanchal and Aravali mountains. In the Karauli tehsil hills become more high and extensive. Hills & broken grounds characterises almost entire area locally known as Dang. Plains are very fertile and clay is very light in weight and sandy. A major part of Karauli & Sapotara tehsils falls in reserve & protected forest. Reserve forest also occur in northern part of Nandauti tehsil. The drainage system is dendritic. The major river is Chambal which forms district and state boundary in east with MP . Other river is Gambhiri emerging from hills of Nandauti tehsil & flowing though Hindaun and Toda Bhim tehsils. Other rivers like Kalisil, Bhadrawati, Bhaisavat, Ata, Manchi and Barkheda solemn rivers are also flowing into the district. The newly formed Karauli district has some very important non-metalic mineral deposits of the state. It has good resources of Silica sand, sandstone and quartz, besides soap stone, limestone, red oxide, laterite etc. Karauli sandstone is well known for its sculpture and engraving property. The red and spotted variety of Karauli sand stone is exported to various countries i.e. Japan, Gulf & other Asian countries. Hindaun is the main business centre for its processing. The details of the mineral deposits are given below. The soapstone in the district occurs in Morra-ka­-Dungar ridge of Toda Bhim tehsil. The talc deposits have been exposed at as many as seven localities near Dhaota, Dwain, Kamalpura, Rajuli, Giarhi, Pura & Morra. Of these, the deposits of Dwain, Rajauli and Garhi are fairly large. About 25 kms. S.S.W. of Karauli the Mohali­-Keladevi lime stone belt is exposed intermitently over a strike length of 16 kms. with 100 to 200 mts width. The limestone is greyish, pinkish and purple in colour and is associated with chert bands at places. The important silica sand deposits are located in Pator-Sapotara area extending from Ganeshwari to Machh villages over a strike length of 1 km. in Sapotara and Karauli tehsils. Besides this the other occurrences are near Jon, Ghat, Parli and Badrela in Toda Bhim tehsil. The laterite occurs near village Bajna, Gathra in Sapotra tehsil capping over Rewa sand stone of Upper Vindhyan Supergroup. It is exposed near Rodhai village of Karauli tehsil. 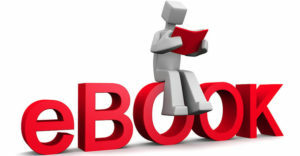 One lease has been executed in the area. At present the production is closed. Both red and yellow ochres are available in the district. These are found associated with quartzites of Bhilwara Super group. The main localities for red ochres are Narayanpura & Tantwara in Sapotra tehsil, Kachrauli in Karauli tehsil. Yellow ochre is only located near village Kherata of Karauli tehsil. Near village Karuali about 7 km. east of Hindaun, Iron ore deposit occurs in the banded hematite chert of Kaimur Group of Vindhyan Supergroup. Karauli sand stone is an excellent building stone as it is amenable to receive good polish and intricate carving meant for lattices and arches. The sand stone occurs in the form of hill range crossing across the district. Most of the quarries are situated in nearby areas of Karauli and Sapotra tehsils. Recently Mines & Geology Department has identified 5 splittable sandstone blocks viz. Bhauapura-Ratiapura (10 sq. kms.) Kasara (2.88 sq.km.) Chobe ki Guwari (4.88 sq.km.) Mokanpura­-Berda( 2 sq. km.) and Bhakri ( 5 sq. km.) of about 25 sq.km. total area. Sand stone is red and buff in colour, fine grained and bedded in nature. According to the 2011 census Karauli district has a population of 14,58,459. Its population growth rate over the decade 2001-2011 was 20.57%. Meena and Gurjer caste dominates in Karauli.